Micromachining processes deal with the production of parts characterized by features in the micro range (i.e., with dimension lower than 1 mm). Several works are present in literature analyzing the tool behaviors, the material influence on the process, and the machine design. In fact, the downsize of the process up to the microscale needs a full review of all the knowledge coming from the meso and macro scale. As a consequence, machines suitable for micromachining processes were recently introduced in the market. Usually, these machines are classified by the classical gantry layout structure supported by a granite frame and, in order to guarantee the needed requirements of precision and accuracy in the micro scale, they are based on fluid-supported axes and active and/or passive vibration control systems. This research proposes a new concept design: a high precision machine (HPM) based on an innovative layout exploiting a differential mechanism with three motors for two degrees of freedom using pulleys and metal belts. This new layout exhibits relevant advantages. The most significant is that all the worktable servo drives, that moves along x and y axes, are ground-fixed. This allows to isolate the working area of the machine from the servo drives. The system of pulleys and belts holding the working table slides on air bearings in order to minimize the micro vibrations induced by all the drives. A further peculiarity of the machine consists of the double z-axis each of them is motorized by a micrometer slide with linear absolute encoder. The first z-axis is equipped with a spindle for performing micro machining processes (drilling and milling). The second z-axis is equipped with a laser head for micro ablation. 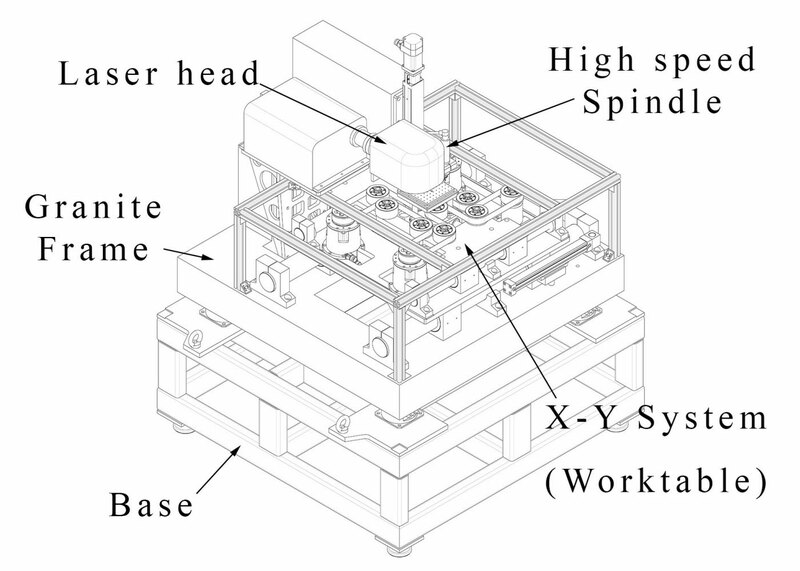 The servo drives of the two z-axes are controlled by the same control system of the worktable. Another important feature of the proposed layout is that the differential configuration of the xy mechanism admits the use of a constant speed signal to each control reference with no output displacements. This allows to guarantee non-inversion of motion of the servo-drives and so the avoidance of problems due to backlash and/or static friction. Drives are controlled by position and speed control loops with PID architecture, antiwindup and feed forward strategies. Controllers have been tuned by the use of a genetic algorithm applied to a dynamic model of the system. As a general consideration, the quality of the investigated micro machining processes can be improved with the designed machine structure. A. Borboni, E. Ceretti, A. Copeta, D. Moscatelli, R. Faglia, and A. Attanasio, “High precision machine based on a differential mechanism,” in ASME 2014 12th Biennial Conference on Engineering Systems Design and Analysis, ESDA 2014, 2014.